Following the philosophy of the world renowned pedagogue and humanitarian, Shin’ichi Suzuki, the faculty at the Western Springs School of Talent Education and the Naperville Suzuki School have been enriching the lives of children through the study of music for over thirty years. 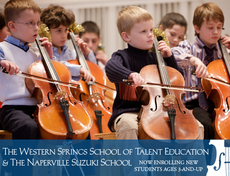 The Western Springs School of Talent Education and the Naperville Suzuki School enjoy a reputation for excellence that is well-known throughout the world. We offer instruction in violin, viola, and cello. Our teaching follows the philosophy and principles of the world renowned pedagogue, Shinichi Suzuki. The Suzuki approach deals with much more than teaching a child how to play an instrument. It seeks to develop the whole child, to help unfold his natural potential to learn and become a good and happy person. Our faculty is comprised of highly trained professional musicians who have selected Suzuki teaching as their chosen profession. All faculty have a bachelor’s degree in music performance or music education and are extensively trained in the Suzuki method. Many of our faculty hold the master of music performance degree with emphasis in Suzuki pedagogy.